Your insurance agent likely prefers you drive a Corvette instead of a Mitsubishi Lancer. That's because, according to the IIHS, Lancer owners report the highest relative insurance losses. Corvette owners? The lowest. Here are the ten biggest insurance losers. The Insurance Institute for Highway Safety compiled data for vehicles in the years 2007 to 2009 in major insurance categories (collision, property damage liability, comprehensive, personal injury, medical payments, bodily injury liability) and combined them to determine what vehicles were worse and better than average. Surprisingly, the three best overall vehicles were the Chevy Corvette Convertible, Mazda MX-5 Miata, and the hardtop Chevrolet Corvette. Despite the prejudice against these vehicles and their owners (both generally and with insurance premiums), people who own these kinds of cars don't crash them or cause serious injuries to others as frequently as other owners according to the data. Other results are fairly obvious, like people who wreck Maserati Quattroporte report collisions losses 3.68 times higher than average and medical payments are twice as high for people involved in crashes with subcompacts like the Kia Rio, Kia Spectra, and Chevy Aveo. Below, the ten worst vehicles overall and the reason why they're the most expensive (relative) for insurance companies between 2007 and 2009. The full list of models from 2004 to 2006 can be found at the IIHS website. Want to see this all in one page that will take forever to load? Click here. Reason: The Mitsubishi Lancer is on both the lists for high bodily injury liability (151) and medical liability (177), meaning crashing one isn't something you'd like to do but something Lancer owners seem to do with some frequency. Reason: There Escalade is high on the comprehensive (338 relative score) list. This isn't surprising, because the Cadillac Escalade EXT is the most stolen car in America. Reason: The Scion tC is on the personal injury list (171) and bodily injury list (150), meaning if you see a tC get out of the way, they might hurt you. There are also a ton of them and buyers tend to be young, though the IIHS says the results are standardize for age, gender, density and marital status. Reason: The Mercedes CLS is high on the collision (224) list, meaning CLS drivers are getting into numerous expensive crashes. 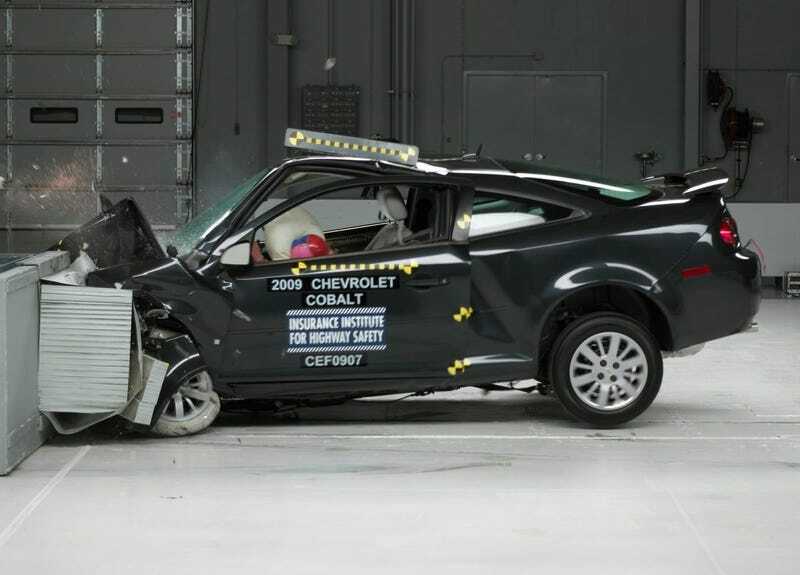 Reason: The Cobalt is on the list for personal injury (172), medical payments (199), and at the top of the list for bodily injury liability (173). Remember that next time you're at the rental counter contemplating a $10 upgrade. Reason: The Dodge Charger appears in the top ten only for bodily injury liability (157), but it's a common vehicle. Reason: The S Class appears on the comprehensive list for comprehensive coverage (312), like the Escalade, meaning people are stealing them or somehow otherwise damaging them. Reason: The Pontiac G5 appears on the medical payments list (188) and is high on the bodily injury liability list (163) with its twin the Chevy Cobalt. Both of these models are being phased out for the Chevy Cruze. Reason: If Chevy Corvettes are at the low-end of insurance losses, the Chevy Cobalt and its variants are on the high side. The Cobalt four-door appears on the personal injury (174), medical payments (187), and bodily injury (163) lists. Reason: The Kia Spectra is second on the personal injury list (186), second on the medical payments list (202) and sixth on the bodily injury liability list (157).